Santa Rosa de Osos (Agenzia Fides) - The parish priest of the rural village of Cuturú (diocese of Santa Rosa de Osos) was threatened with death for refusing to pay bribes to one of the active armed groups in the area, the Bishop therefore decided to transfer him temporarily, for security reasons. This is what Agenzia Fides learns from the statement sent from the same diocese. Mgr. 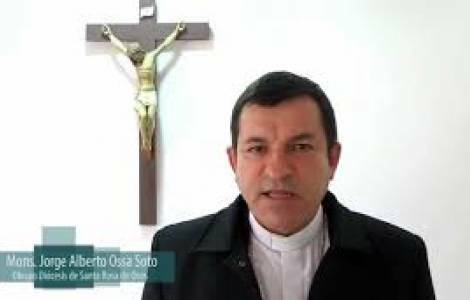 Jorge Alberto Ossa, Bishop of Santa Rosa de Osos, says in the text that "the diocesan Catholic Church will never give money to any outlawed group promoting violence. This would mean legitimizing actions that are in radical contradiction with the Gospel of Our Lord". "Unfortunately - continues the statement - Cuturú will remain without its priest. We do not want another dead among many other innocent people". The statement describes the situation in the communities of the north-northeast region of the department of Antioquia, subject to threats, extortions and killings by various criminal groups. The inhabitants of Bajo Cauca are "suffocated by fear, pain and above all impotence, because they do not feel accompanied and defended by the institutions".